This is another edition of Previously on Amara and is taken from an email that I sent to my sister on October 8, 2007. Amara would have been about 3 years old. There is a story behind this picture. We have always had this running joke — started by Jenna — that I am freakishly strong! Jenna is strong but she is not freakishly strong like me. We do think that Amara is going to be freakishly strong and we talk about it all the time. In fact they have been having some issues with Amara not wanting to eat the food that is good for her but only the things she wants. Sometimes these are things that are good for her but you can’t live on cheese alone for days on end! 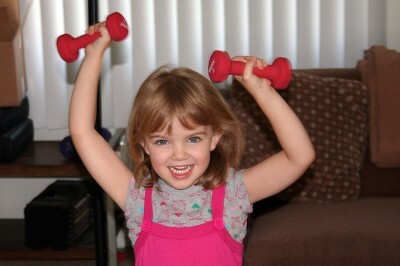 Amara loves that we tease her about being strong like Grandma — she is forever doing the strong man pose! Anyway, they are getting her to eat at least a bit of things she might not otherwise eat by telling her it will make her strong! I really wish I could have gotten a picture of her eating the slice of “cooked” carrot! It was just hysterical! I gave her a sticker for it. Later on that evening she picks up my 5 pound weights!!! I made her put them down but I did let her play with the 2 pounders long enough to take these pictures! This memory was posted in Previously on Amara and tagged Amara, freakishly strong, Grandma, strong man pose, weights on May 21, 2011 by Grandma Kc. I think it’s awesome Amara wants to be like her strong grandma! I’ve heard kids think Grandma is lots of things, but this is the first for strong! You go, Grandma! Being the strong healthy Grandma is certainly better than being the old decrepit Grandma. My one Grandmother was 95 and pretty darned healthy when she died. My goal is 96! Grampy wants 156? I love the new design of your website. Thank you so much! It really was a work of love. Amara and I like it but it means so much to get praise from someone else! I remember this email !!!! I love having a freakishly strong sister – and great niece!!!! I love you baby sister?! My emails to you give me an awesome source of inspiration and lots of memories! Amara loved reading this one and hearing about how much she hated that cooked carrot. She still does! I love this pic! My grandchildren are also fascinated by my hand weights. I love that she is so active and I sure don’t want to discourage it. I have pictures of her doing sit ups on Grandpa’s bench, hula hooping, jumping rope – all sorts of fun stuff. Helps keep me young just trying to keep up with her! Freakishly strong seems like an awesome way to think of one’s grandma. I have to agree with you! Nice to have my daughter think of me that way too and it helps for keeping Grampy in line! I can take that kid any day!! How cool for Amara to have a strong grandma. My Granny was freakishly strong too, but I think that’s because she was a farm wife who worked hard. She was only about 4’8″ tall, but she could pick a surly teenager up by the nape of the neck and the seat of the pants and put her on the right track. The funniest thing ever with Amara and food is when I gave her a cherry tomato when she was about 3. She bit into it, got this horrified look on her face, and her mouth went into a perfect ‘O’ as every part of it tried to get as far from the tomato as possible. I have to give her a lot of credit – even at 3 she had the self-control to not just spit it out. No, what was really the funniest part of your story is the look Amara gave you when she bit into that tomato! It said “Grampy, how could you do this to me? I thought I could trust you?” She looked so betrayed! Now that freakishly strong thing has me curious! Just how strong are you? 😉 Amara has to be one of the prettiest, cutest kids I have ever seen! Thanks for linking up with me. She is so CUTE in this photo! Well I am with Amara on the cooked carrots! Ewwww! But don’t worry, honey, there are other ways to get your vitamins! As I write this, REAL hugs and not just emails are a mere few days for Kc and Sandy! Michigan is waiting for you, Kc! Amara’s so right about cooked carrots. I’ve always thought it odd that pureed carrots are one of the first baby foods. Although…babies do seem to love them. Cheers to freakishly strong grandmas AND granddaughters! A great thing to have in common.